Wow, Thanks for sharing, very nice! Was wondering what kingpoop place is.. i am so glad i am here.. anyways tyvm..i hope i can take these to my simonstick..
Its an evil place filled with hateful people who just hate to hate. I went in to be friendly (and get a client that I could download everything because I want to backup my crap and archive things for the next iteration of SL) and I apperently helped too much because people got pissy and banned me because I was here and shared thing between both. So I stay here. You should too. un grand merci ça va être très utile. Thats alot of Sculpts. hanks so much for the great share. (06-04-2015, 06:30 PM)Michael™ Wrote: Ok I've been away because Pale Moon hates this site for some reason (it won't let me log in) and I use it for almost everything. SO I've been away for awhile. So as a yes, I'm still here. Here is my entire cache of sculpties. Its about 2500 of mostly everything you can imagine. Tools, utensils, animals, appliances, stuff I've ganked from others either via gl intercept or copybot. Hell I think it actually includes stuff I got from KingGoon too. Nevertheless, I want to share this because it will save time if you want to make something. 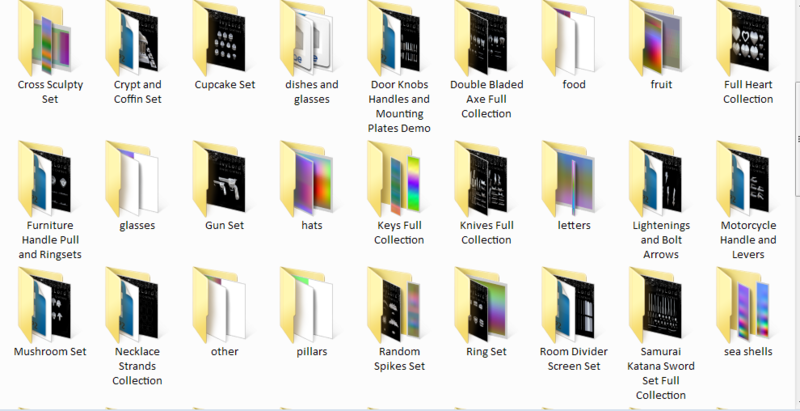 Its organized into folders. Un grand merci pour le partage et super travail de ta part.